According to those familiar with Apple's plans, the company is going to finally announce the purchase of Beats Audio this week. However, the price has been knocked down to $3 billion from the original $3.2 billion that Apple was expected to pay, when the rumor first broke earlier this month. It would still be the largest transaction in Apple's history. According to a report published on Tuesday, Apple wanted to cut the price of the deal once it learned that Beats Music, the streaming music site coveted by Apple, had only 111,000 paid subscribers in March. Apple wants to use Beats Music to improve the reception that iTunes Radio has received. In comparison to the tepid roll call that Beats Music has, rival Spotify has 10 million paying subscribers, and 30 million who listen for free. While Beats Music wouldn't seem to carry such a high valuation, Apple does believe that the Beats Audio headphones division is worth a King's ransom. This is the part of the company that produces and sells high end headphones, priced as high as $450. That division brought in revenue of $1.3 billion last year. One person close to the talks said that Apple had not even conducted its due-diligence when the initial rumor broke. A report last week from music publication Billboard stated that Apple was miffed at Beats co-founder Dr. Dre, who recorded a video selfie when the deal was first rumored nearly three weeks ago. Allegedly drunk, Dr. Dre bragged in the video that he was now the first hip-hop billionaire. 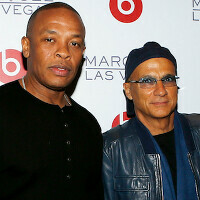 According to figures from Forbes, Dre stood to make $800 million from a sale of Beats Audio at $3.2 billion. At $3 billion, he might have to recant his statement. At the latter price, Dr. Dre would gross about $750 million from the sale. After paying Uncle Sam, the good Doctor would probably fall short of his $1 billion goal. I was hoping it wouldn't happen. Apple would make the Beats brand look bad. Fandroid, Apple actually gonna make the Beats brand better. While apple would undoubtedly bring a whole new level of fail to Beats, I think they've done a good job making themselves look bad. Average audio quality, poor construction, overpriced, and a drunken braggart who beats women for an exec is a pretty good start to looking bad. Except with apple you would still get all that, but a $300 set of headphones just became a $600 set of headph- excuse me, iHeadphones. Makes me wonder if WWDC is not going to be about the "connected home" as people think of it today, but more along the lines of "connected home for audio/video", something along the lines of Sonos. Apple acquiring Beats is an important step in Apple becoming a caricature of themselves. "exaggeration by means of often ludicrous distortion of parts or characteristics"
You stole my reply! But exactly the point ! People have been building better cars from backyard scratch! But the Porsche is all about brand ! Apple and Beats are marketing driven "brand" companies, but there are very few people or companies that build better cars than Porsche. Just sayin. It is more of a red headed adoption than a marriage. That's going to be my next head phones. Do u know if they make bluetooth? And when he beats up more women, they can sue him for more money. Jealous of beating women? Where does he imply that? You were all hot for an obviously underaged girl a day or two ago weren't you, all Jedi approved and all. Attacking underaged girls. Wow feeling hot for a young girl whose not 18 yet. Hopefully he is talking about how some people bring up old events to tear a person down even though the person has changed their ways. The incidents with Barnes and Michele happened over 20 years ago. Maybe the guy has seen the error in his old ways and have changed. Has there been any recent incidents of spousal abuse? Has there been any incidents of breaking the law in general? The guy took a cheap shot because he didn't have anything else to go on. It's sad, because when I see Dr Dre, I see somebody who has made it out of hell, lost it all to leave Deathrow, then regain it all and then some. If 0xFFFF wants to talk about something, talk about what the man is doing now in his life. Like the $70 million he and Lovine gave to Univ of So Cal. @greathero1: IMO, you are trivializing a serious aspect of a person's character that should not be trivialized. http://pando.com/2014/05/23/beaten-by-dre-apple-plans-to-acquihire-a-man-who-violently-assaulted-a-woman-and-the-tech-industry-doesnt-care/ Personally, I don't believe in the "money is everything" philosophy. Some people are like this and generally speaking the world is worse because of it. "Jealous" of what? More like concerned and worried that this patent troll company is monopolising and bullying and trying to close other Oems from progressing. I forgot it's your beloved iFruit company.